(PRWEB) October 10, 2009 -- With an extensive and solid line of field-proven compact tractors, KIOTI is pleased to announce their new line of Utility Transport Vehicles for work or for recreational uses. Following years of design and both factory and field testing, these new models, will soon be available to the North American marketplace. 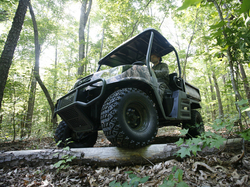 The new MECHRON™ is a pure UTV, offering more combined productive features for either work or recreation than any other UTV in North America. This Ultimate Transport Vehicle™ is driven by a fuel-efficient 22hp, 3-cylinder Daedong diesel engine that gives superb power and excellent fuel economy. With one of the widest tracks on the market and 4-wheel drive, the MECHRON™ delivers stable operation and superior traction over challenging terrain and up steep slopes. Front limited slip differential and rear differential lock are standard. The KIOTI UTV offers a 56"-wide dump bed - the widest on the market - for a 1600 pound payload capacity, 23% higher than the market leader. For a smooth ride over rough terrain, the MECHRON™ includes a MacPherson strut suspension up front and independent Dual-A arms with adjustable coil springs in the rear. An industry-leading 12" ground clearance creates a smoother ride on bumpy roads while helping to maintain the chassis even under the heaviest of loads. For excellent maneuverability and steering ease, the KIOTI UTV features rack and pinion steering and 25 x 10-12 tires up front. Heavy-duty tubular steel frame construction and OSHA approved ROPS with seat belts are standard equipment. Its wide track and ergonomic design allow for a wide bench seat on which three people can ride comfortably. Standard equipment includes a two-speed continuously variable transmission, four-wheel disk brakes, a rear hitch receiver for a trailer or three-point hitch, a convenient operator station with lots of storage compartments, halogen headlights and an excellent design for easy servicing. Options include a hydraulic lift for the dump bed, front receiver and winch, rear operator screen, windshield, work lights, fog lights, dump bed cargo extenders and a Realtree Camo™ finish. KIOTI also manufactures a full line of compact tractors in the 22 - 90 horsepower range from their Wendell, North Carolina headquarters. Both the tractor line and the new UTV line are available through the KIOTI dealer network. Dealers can be found on their website. KIOTI is now celebrating over twenty years in North America. For more information on the Ultimate Transport Vehicle™ or other KIOTI products, please call 877-465-4684 or visit www.KIOTI.com.